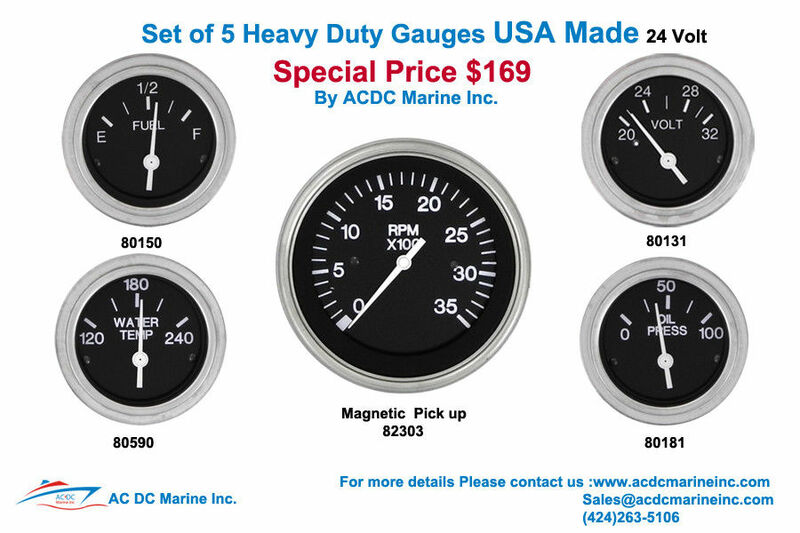 Heavy Duty Set of 5 Marine gauges Magnetic pickup 24V – AC DC Marine Inc. The Heavy Duty line of gauges is a proven, accurate and reliable solution for a diverse range of industrial applications. The glass lenses are highly scratch resistant, providing a clear view of the fascia for the life of the gauge. White graphics on a black dial background are easy to read and white perimeter lighting can be added to provide good night visibility. Pointers are high contrast white. Standard bezels are stainless steel. The gauges are designed and manufactured to the highest standards to meet a full range of specifications, from temperature and shock to humidity and over-voltage requirements. The electrical movements are magnetically shielded to eliminate electrical interference and are CE certified.